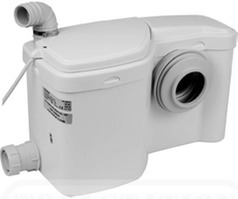 Macerator for toilet and basin with dual basin inlets. Size: 466W x 275H x 215D mm. Enables the installation of a WC and basin in areas where conventional waste pipe installations cannot be fitted. Dual basin inlets (either side of unit). Discharge: horizontally to 45 metres or vertically to 3.5 metres. All vertical lifts must begin within 300mm of this unit. Horizontal runs must have a minimum 1 in 100 (10mm per metre) fall away from the unit. This unit is not designed to pump on an uphill gradient away from the machine. Outlet size: 32mm (1 1/4"). Electrical connection must be into a 5 amp un-switched fused spur (not socket). 2 Year Warranty: Watereasy give a 2 year warranty on this macerator.